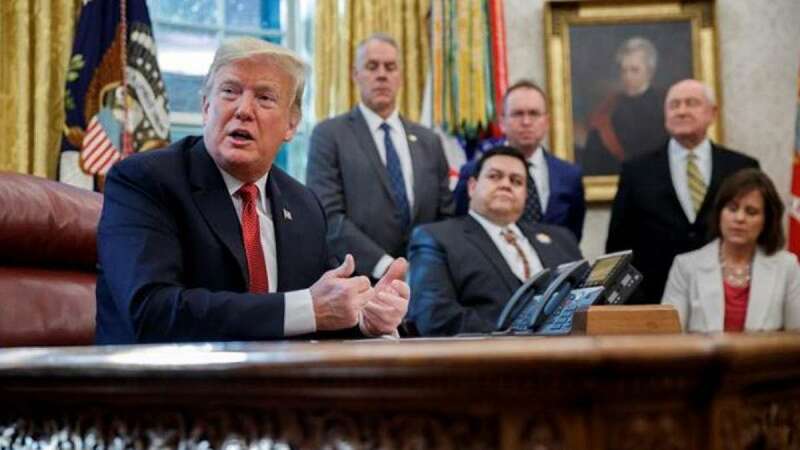 Washington : US President Donald Trump announced that he intends to reduce the American federal budget deficit by cutting financing to every government agency and department by 5 per cent. "I'm going to ask each of you to come back with a 5 per cent cut for our next meeting, I think you'll all be able to do it... Get rid of the fat, get rid of the waste... It will have a huge impact," Trump told the Cabinet at the White House on Wednesday, adding that he would be willing to allow "special exemptions" for one or two departments but some might have to undergo cuts larger than 5 per cent. Trump's proposal comes after the Treasury Department reported that the federal budget deficit increased this year to $779 billion, or by 17 per cent over last year, the largest deficit in six years, reports Efe news. Although he did not get into specifics, Trump probably was referring to the cuts that will be in his administration's budget proposal for fiscal 2020, which he will send to Congress at the beginning of next year. However, although the President can ask his Cabinet members to cut their departments' budgets, the federal funds are ultimately approved by Congress, quite apart from the wishes and desires of the president. Lawmakers have the freedom to include their own spending plans for federal agencies and the rest of the government, although the president has the right to veto any budget they approve. Three-quarters of the federal government's operations have been financed through the end of September 2019, while the remaining agencies, including the Departments of Agriculture, Justice, Transportation and Homeland Security have been funded through December 7. Congress will try to avoid a partial government shutdown and approve a budget for those agencies before the end of this year. Trump had already asked for double-digit spending reductions for some federal departments, but this was rejected by Congress. The president's first budget proposal, made last year, included eliminating 62 agencies, something that legislators completely ignored. Trump has blamed Democrats in Congress for seeking to raise spending on national programmes in exchange for fulfilling his wish to strengthen the military, but his tax reform has had one of the greatest impacts on increasing the deficit since it imposed significant tax cuts, especially on the wealthiest taxpayers. Despite the fact that he does not want to cause a government shutdown prior to the November midterm elections, the magnate might be willing to do so in early December, before the next budget negotiation deadline.